Colored denim has made its debut with fall and winter layers to keep it cozy, but as our favorite celebrities have shown, easy tanks, fresh booties, and patterned pumps are transitioning these bright bottoms into the months ahead. And to put a warm-weather spin on things, pastels and candy-colored denim are trending for summer and spring. If you’re doubting their versatility, think again. Although they pair perfectly with your favorite neutral tops, try jumping on board the color-blocking train, and pair your favorite colored tee with a slim fitting pair of jeans. All the sudden, voila! You’re ready for an eye-catching night out.If you’re looking for fun shade of denim, we’ve found the best in candy-colored jeans for the spring. Take a cue from celebrities, bloggers, and street style stars, and browse below to see these pops of color. 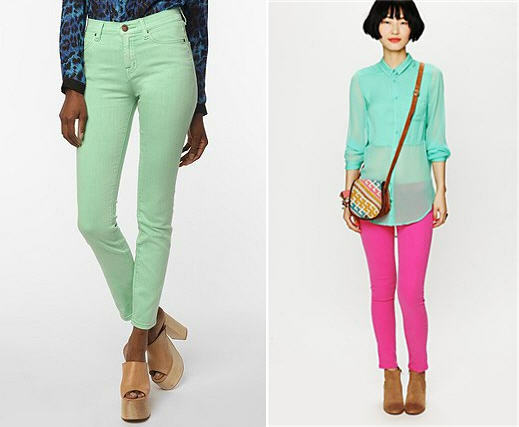 Try these cigarette-thin skinnies in bright turquoise to enliven your look. Celebrate the tulips and daisies popping up left and right, and don a shade of purple to stay ultra feminine cool. Another hot shade of colored denim for the spring? Mint! Nothing screams clean and fresh more than this easy shade, which pairs perfectly with grays and whites. Take a walk on the wild side, and opt for a hot-pink pair of pants to turn things up a notch. At the other end of the color spectrum, these rich turquoise skinnies are ideal to pair with a kelly-green top for the ultimate in color-blocking. And nothing pays homage to the warmer months better than a bright yellow pair of bottoms, made current with distressed detailing.